Kpreps Friday First Look provides our initial reaction to some most notable games and performances in the state from Week 3. After entering the season on a 10-game losing streak, Gardner-Edgerton is now 3-0 after a 33-13 victory at Lawrence on Friday night. New head coach Ryan Cornelsen’s team rushed for 350 yards in Friday’s win at Lawrence. The Blazers were led by Luke Hennings’ 151-yard night that included a 34-yard touchdown in the first quarter. Gardner-Edgerton’s move to the Sunflower League from the Eastern Kansas League appears to have been a beneficial one. The Blazer’s remaining schedule sets up well for them to potentially win 6 to 8 regular season games and secure a high seed on the eastern half of Class 6A. Second-ranked Lawrence Free State rolled to a 62-0 victory over Shawnee Mission North on Friday night. The Firebirds have yet to be scored upon this season having outscored Olathe West, Olathe East, and Shawnee Mission North by a combined 144-0. Jax Dineen rushed for 162 yards and two scores and Malik Berry and Keenan Garber hooked up for two more touchdown passes for the Firebirds. Berry threw four touchdown passes on Friday and has connected with Garber on six scoring strikes this season. The Indians handed the Vikings their first loss of the season thanks to a big performance from senior running back Kevontae McDonald. McDonald rushed for 190 yards and four touchdowns to lead the Manhattan offense. After an early McDonald touchdown, Seaman tied the game at 7-7 on a short Kobe Jones touchdown run. But Manhattan would take the lead right back as Jaylynn Liggons returned the ensuing kickoff 85 yards for a touchdown. The Indians can take a big step towards securing at least a share of the Centennial League title for the ninth time in the last ten seasons when they travel to unbeaten Washburn Rural next week. Dodge City dominated Wichita Heights 49-27 to win its second straight game. Dave Foster’s team returned a lot of talent this season and were expected to improve upon 2017’s 3-6 record. But the Red Demons were beaten soundly, 47-9, by Haysville Campus to start the season. Dodge City has responded with a 27-17 road victory over Salina South and Friday’s complete performance against Wichita Heights. Special teams helped Dodge City build a 28-14 halftime lead on Friday night. The Red Demons’ Cedric Rosales blocked a Falcon punt and returned if for a touchdown, then late in the second quarter a fake field goal resulted in a touchdown pass from Lakin Scheck to Sam Mead. Heights pulled to within 28-27 in the third quarter after a K’vonte Baker touchdown run and a pick-6 from Jamir Johnson. Dodge City would again have the answer. Beau Foster rushed for two more scores sandwiched around a Jaiel Johnson 28-yard touchdown run to allow the Red Demons to pull away for the victory. How about Shawnee Mission Northwest? The Cougars remain unbeaten after slipping by Olathe South, 27-21 in overtime on Friday night. Freshman quarterback Blake Reeder tossed a 10-yard touchdown pass to Ty Lindenman in overtime on what proved to be the game-winning score. The Cougar’s PAT was blocked meaning the Northwest defense would need to protect a 6-point lead in order to win. Payton Carder made sure that happened by knocking down Olathe South’s fourth-down pass to move the Cougars to 3-0. Northwest quarterback Ty Black and Olathe South quarterback Evan Foster both left the game with injuries. One of the most unique things occurred in the second quarter of Topeka High’s 66-0 victory over Topeka Highland Park. Trojan junior all-state running back Ky Thomas broke free for a 60-yard touchdown run in the second quarter. But that’s not really the cool part of the story…he’s done that many times before. But his time, his younger sister, Talayah Thomas, kicked the extra point! This may be the first time in state history that a brother and sister have contributed to their team’s scoring in the same game. What a cool moment for the Thomas family! After consecutive 49-0 wins to open the season, the Maize Eagles made a statement on Friday night. They can also win with defense. Maize traveled to Campus and shut out the Colts, 21-0. Caden Cox got the scoring started with an 8-yard touchdown run for a 7-0 first-quarter lead. That’s all the Eagles would get until Camden Jurgensen returned the second-half kickoff 95-yards for a touchdown and a 14-0 lead. Senior quarterback Caleb Grill would later toss a touchdown pass to Jordan Helm for good measure. The Eagle defense again dominated in posting its third consecutive shutout. After three weeks, Maize, Lawrence Free State (6A), Scott City (3A), Jackson Heights (1A), and Madison (8M-I) are the only remaining teams in the state that have yet to surrender a point. This one turned out like we expected. Wichita Northwest outscored Great Bend 56-34 on Friday night to remain unbeaten. The Grizzlies and Panthers have engaged in a pair of shootouts over the past to seasons, and this one was no different. After being tied at 14 in the first quarter, Northwest scored four consecutive touchdowns to lead 42-14 at halftime. The Grizzlies then opened the third quarter with a touchdown drive to lead 49-14. That’s when Great Bend’s offense got going. Koy Brack tossed touchdown passes to Calan Haberman, Peyton Duvall, and Alex Schremmer to pull the Panthers within 49-34. Northwest would then answer with a time-consuming drive and a score to secure the 56-34 win. Brack completed 17 of 18 passes for 344 yards and five touchdowns for Great Bend. Wichita Northwest defeated Great Bend 63-27 last season, while Great Bend won 58-47 in 2016. Salina Central knocked off crosstown rival Salina South, 27-3, to win the Mayor’s Cup for the first time since 2010. Taylon Peters rushed for 150 yards and a touchdown and added a touchdown catch in the win. Jackson Kavanagh threw touchdown passes to three different receivers in the win. Salina Central will host Hutchinson (1-2) next week, while Salina South will look for its first win with a road trip to Haysville Campus. Pittsburg used an opportunistic defense and big plays on offense to defeat Blue Valley North, 34-31, in a game that featured wild momentum shifts. Ty Roark’s 17-yard touchdown pass to Brett Freeman with 1:30 remaining proved to be the winning score as Pittsburg later intercepted Mustang quarterback Henry Martin’s heave in the end zone to secure the win. Blue Valley North senior quarterback Graham Mertz, a Wisconsin commit, left the game in the first quarter after an apparent injury to his left knee that occurred after a tackle. Pittsburg built a 21-10 lead at intermission after returning two interceptions for touchdowns in the first half. Joel Kafka got the scoring started with a pick-6 of a Mertz pass that deflected off of a receiver’s hands. Mertz would answer with a 52-yard completion to Cameron Burt that eventually set up his own 1-yard TD dive to knot the game at 7. He would leave the game after being injured on the Mustangs’ next possession. Blue Valley North then used a combination of Kendall Hargans and multiple backs and receivers out of the wildcat in the second quarter. But without Mertz, the Mustang offense seemed to struggle with timing and, at times, securing the shotgun snap. Hargans led the Mustangs on short drive that resulted in a Spencer Sprenger 34-yard field goal and a 10-7 lead. After Pittsburg answered with a Roark to Dylan White 39-yard touchdown pass, Blue Valley North threatened late in the first half reaching the Dragon 10-yard line. But Hargan’s throw-back pass was intercepted by White just outside the goal line and returned 98 yards for a touchdown with five seconds remaining until halftime. Pittsburg began the third quarter with a 70-yard drive resulting in a 12-yard touchdown pass from Roark to Kafka to go up 27-10. That’s when Blue Valley North inserted freshman Henry Martin in at quarterback. Martin, who last spring received an invitation to the U.S. Army All-American freshman game, began with a series of short passes and eventually led the Mustangs comeback by throwing three touchdown passes in the second half. Martin’s third touchdown connection gave Blue Valley North a 31-27 lead with 10:47 remaining. The two teams traded possessions before Pittsburg took over with less than three minutes remaining and drove 90 yards for the winning score. Saying that the game changed when Mertz went down would be an understatement. He was helped to the sideline was helped the sideline without putting much weight on his left knee. Upon reach the sideline, he appeared to walk unaided over to a bench. Mertz walked off the field at halftime with the aid of a single crutch (WATCH VIDEO). Prior to the second half, Mertz returned to the field and appeared to test his ability to return by taking snaps and going through drops, but never put his shoulder pads back on. KC Piper moved to 3-0 with a 56-28 rout of Atchison. The Pirates have sort of gone unnoticed this season under first-year coach Rick Pollard. Piper joined the Frontier League this fall and opened with victories over new league opponents Eudora (28-7) and Baldwin (51-7). On Friday, Atchison led the Pirates 12-8 early in the second quarter before Piper scored three consecutive touchdowns to lead 31-12 at halftime. Dalton White then rushed for a pair of touchdowns in the third quarter to provide separation for the Pirates. Dalton White rushed for three scores in the game, while LaJames White added two scores on the ground. The Wellington Crusaders picked up win number 600 in school history on Friday night, defeating Clearwater, 47-26. Grey Hatfield rushed for 196 yards and four touchdowns and quarterback Michael Ledbetter added more than 200 yards through the air to lead the Crusader offense. DeAndre Washington hauled in six receptions for 140 yards and a score for Wellington. Ulysses won a second-consecutive home game by beating Hugoton, 29-6. The Tigers forced Hugoton into a safety in the first quarter, then Victor Perez returned the ensuing kickoff for a touchdown and a 9-0 lead. Hugoton pulled to within 9-6 at halftime on a touchdown reception by Jagger Hertel. The Tigers threatened in the third quarter, but Hugoton stopped them on fourth down and goal. Hugoton took over, but an errant snap resulted in a second Ulysses safety and an 11-6 lead. The Tigers later added a pair of touchdowns to win 29-6. The most notable statistic of the night was Hugoton’s donation of a percentage of its proceeds from the Eagles’ home-opener to the education fund for the children of late Ulysses coach Jason Kenny. Kenny, the Ulysses coach for the past 18 seasons, passed away late this summer. Second-ranked Sabetha survived a late touchdown and two-point conversion attempt to hold off No. 5 Perry-Lecompton, 35-33. Sabetha grabbed a 35-19 lead with 2:36 remaining in the third quarter as Gabe Garber broke seven tackles on his way to a 35-yard touchdown run. Dalton Kellum broke free for a 68-yard run to pull the Kaws within 35-27. Then Kellum added a 7-yard touchdown run with 57 seconds remaining to pull the Kaws within a two-point conversion of the tie. Perry-Lecompton’s William Welch faked the handoff to Kellum and rolled out to his left in an attempt to hit Colton Mallonee in the corner of the end zone, but the pass was knocked down by a Sabetha defender. Welch saw time at quarterback in the second half with Kellum switching to running back. Kellum finished with 31 carries for 236 yards and four touchdowns. Garber rushed for three touchdowns to lead Sabetha. Mason Engelken and Joel Hackney also added touchdown runs for the Blue Jays. This Central Kansas League showdown between two of Class 3A’s top teams turned in to a rout. Pratt got a huge night from Kadence Riner in blanking Hesston, 55-0. After Pratt standout Travis Theis got the Greenbacks on the board early in the first quarter, Riner then added five consecutive touchdown runs to give Pratt a 41-0 lead at halftime. Riner would score his sixth touchdown on an interception return in the third quarter, and Theis would later add a 25-yard run for the final 55-point margin. Chapman beat rival Abilene 26-0 on Friday, stopping a streak of five consecutive wins in one of the nation’s oldest rivalries. The Irish led 14-0 at halftime, and extended that lead with a touchdown in each of the third and fourth quarters. Chapman and Abilene have met on the gridiron since 1892 and is believed to be the oldest rivalry west of the Mississippi River. The Colby Eagles are 3-0 after a 38-34 victory over Holcomb on Friday night. Colby led 22-20 at halftime on the strength of a pair of Isaac Rosales touchdown runs and a score by Jordan Schippers. The Longhorns scored twice in the third quarter to take a 34-22 lead. Peyton Ortner scored on a 35-yard run, then tosses a touchdown pass to River Amos. Schippers connected with Rosales to pull Colby within 34-30, then Calvin Stapp’s 13-yard run gave the Eagles the lead for good. The win by the Eagles stops a run of nine consecutive losses to Holcomb. 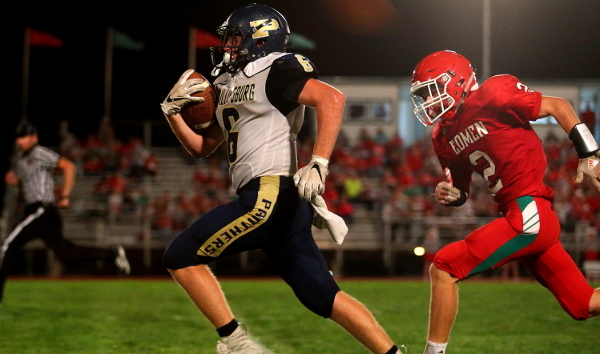 In a battle of top-ranked teams in Class 2A and 1A, it was the 2A Phillipsburg Panthers that run away with a 42-14 victory over Smith Center in the Kpreps Fan’s Choice for Game of the Week. Phillipsburg led 7-0 after the first quarter on a Treylan Gross 1-yard run. The Panthers tacked on a Trey Sides 25-yard run in the second quarter for a 14-0 lead, then after a fumble, scored on a touchdown pass from Trey to Ty Sides for a 21-0 lead at the half. The Phillipsburg defense got in on the scoring in the third quarter as Austin Miller picked up a Panther fumble on a completion and took it the remaining 8 yards for a touchdown. Gross then added a touchdown run as Phillispburg led 35-0 after three quarters. After a Smith Center touchdown, Gross would add his third score for a 42-7 lead. Gross finished with 167 yards on the night to lead Phillipsburg. The Panthers have now defeated Smith Center eight consecutive times. Silver Lake led Riley County 10-0 at halftime and then went on to beat the Falcons, 31-12. On Friday the bulk of the offensive load fell on senior quarterback Mason Griffin. Griffin passed for 247 yards and three touchdowns, throwing scoring strikes to Christian Stoner, Logan Matzke, and Reid Walker. Wyatt Heiman caught six balls for 77 yards to lead the Eagles, while Stoner had three catches for 66 yards. Riley County slowed the Silver Lake ground game to 79 rushing yards on 24 attempts. The win was Silver Lake’s 22nd consecutive in the series. Congratulations to the Central Heights Vikings for snapping an 18-game losing streak with a 34-22 victory over Wabaunsee. In their first season back in 11-man football, Pleasanton took a major step in winning the Three Rivers League championship with a 36-12 victory over Jayhawk-Linn. The Blujays outscored Jayhawk-Linn 30-6 in the second half to get the victory. Pleasanton scored 30-consecutive points to end the game. Jayhawk-Linn had won the past two TRL league titles. Jackson Heights shut down the high-scoring Maur Hill-Mount Academy offense on Friday night, winning 14-0. The Cobras took an early 6-0 lead on a Cooper Williams touchdown run, and held that lead until Kolby Rethman scored with just under 90 seconds remaining in the game. Jackson Heights limited the Maur Hill offense to less than 150 yards of total offense. The Cobras will host unbeaten Olpe next week. Congratulations to the Flinthills Mustangs for their 34-20 victory over Oxford. The Mustangs ended a 35-game losing streak that dated back to a 42-8 victory over Elk Valley on September 19, 2014. The Fairfield Falcons are also in the win column after Friday night. The Falcons outscored Burrton 50-38 to snap their 19-game losing streak. Third-ranked Hodgeman County won the battle of ranked teams in 8-Man, Division I with a 28-14 victory over No. 4 South Central. The Longhorns scored twice in the first quarter to take a 12-0 lead. Chayde Snyder got South Central on the board with a touchdown pass to Jonny Robles to pull the T-wolves within 12-6. The Longhorns added another touchdown before halftime to lead 20-6. Snyder would score from 18 yards out to pull the T-wolves within 20-14, but Hodgeman County would add a late touchdown to win 28-14. Top-ranked Hanover rolled over No. 2 Mankato-Rock Hills 68-0 on Friday in a game that ended at halftime. Rock Hills was expected to play without some of their top players. The Wildcats have now won 27 straight games and have to be the clear cut favorite to win a third straight 8-Man championship. In a key district game in 8-Man, Division II, South Barber outlasted Hutchinson Central Christian 70-68 in three overtimes. South Barber scored a touchdown in the fourth quarter to tie the game at 48 and force overtime. Each team scored six on their first overtime possession, then eight on their second. South Barber was able to convert a two-point conversion in the third OT to provide the difference. The win likely put the Chieftains in the driver’s seat to capturing the District 7 title.